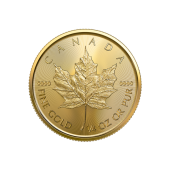 Buy 2019 1 OZ Gold Canadian Maple Leaf coins from Universal Coin & Bullion and diversify your portfolio with one of the world’s most popular, most liquid gold bullion coins. When Canadian Maple Leaf gold coins were first released by the Royal Canadian Mint in 1979, it was one of the world’s first gold bullion coin and quickly became a sought-after asset among countless precious metals investors. Canadian Gold Maple Leafs are a must-have for anybody who wants to hedge their bets against the tumultuous world markets, and they are also ideal for inclusion in precious metals Individual Retirement Accounts (IRAs). Many individuals who invest in IRAs put their money into paper assets such as stocks. But what happens when the market tanks? You lose some of your hard-earned money. We’ve seen similar situations happen before, and it is sure to happen again, and probably when you least expect it. However, with gold coins in your IRA, you can rest assured your investment money is diversified and building real wealth in precious metals that humanity has treasured for thousands of years. It simply makes sense to diversify your investment portfolio or retirement account with gold and other precious metals. 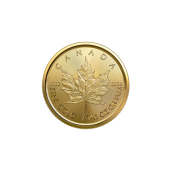 They’re Government Backed – The content, weight, and purity of each Maple Leaf gold coin is guaranteed by the Government of Canada. Legal-Tender Money – Maple Leaf coins are monetized Canadian legal tender! Historic Heritage – Maple Leaf gold coins come from our friendly, politically stable neighbor, the Great White North. 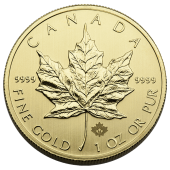 Investment-Grade Gold –Gold Maple Leafs made since 1982 contain one full Troy ounce of .9999-fine, 24-karat gold. 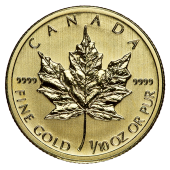 A Solid Investment – Canadian Maple Leaf gold coins have a proven track record. Highly Liquid – It’s easy to sell Maple Leaf gold coins throughout the United States. 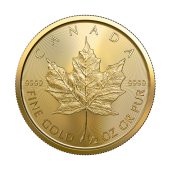 Why Buy 2019 1 OZ Gold Canadian Maple Leaf Coins From Universal Coin & Bullion? 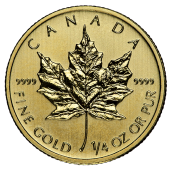 At Universal Coin & Bullion, we offer the finest 1 OZ Gold Canadian Maple Leaf coins available. Each coin in our inventory is hand selected by award-winning author and coin authenticator Dr. Michael Fuljenz and his team of bullion specialists. Dr. Fuljenz, known as America’s Gold Expert, serves as our longtime expert and ensures our coins are genuine and are the best investors will find anywhere. All of our coins are backed by our expert authenticity and quality assurance, and we stand behind every coin we sell with a 100% satisfaction guarantee. Every order over $99 ships free, and all orders are shipped in discreet, secure packaging to ensure they arrive safely at their destinations. Contact Universal Coin & Bullion today at 800.822.4653 and our account representative will gladly educate you on the 2019 1 OZ Gold Canadian Maple Leaf coins. Act now, before prices increase on these popular bullion coins. Canadian Gold Maple Leaf coins were first struck in 1979 and were only the second major bullion coin to hit the international market after the South African Gold Krugerrand coins. While the gold Krugerrand has been around since 1967, the coin was not widely distributed during its first decade. Precious metals investors were overjoyed when the controversy-free Canadian Gold Maple leaf coins hit the market, and they have been among the most frequently traded bullion coins ever since. The Canadian Maple Leaf coins are produced by the Royal Canadian Mint, which is one of the world’s most renowned minting facilities. Canadian coins are lauded for their artistic beauty, and the Maple Leaf coins are no exception. The obverse of the Canadian Maple Leaf gold coins features the effigy of Queen Elizabeth II, who has served as Canada’s queen since her ascension to the British throne in 1952. The reverses of the Maple Leaf coins depict the series’ namesake sugar maple leaf, which is a national symbol of Canada. 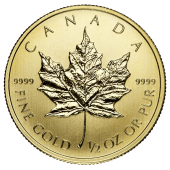 In addition to gold Maple Leaf coins, Canada also strikes .9999-fine silver Maple Leafs, which are a popular purchase for precious metals investors. Both the gold and silver Canadian Maple Leaf bullion coins are top picks among investors and are widely traded throughout North America and beyond. 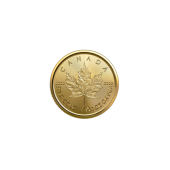 Add 2019 1 OZ Gold Canadian Maple Leaf coins to your investment portfolio today and help shield your investments against tumultuous markets. 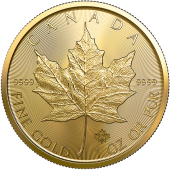 Call Universal Coin & Bullion today at 800.822.4653 today and buy your Canadian Maple Leaf gold coins now before prices increase.